In this issue of SmartDO eNews, we will introduce the new SmartLink module of SmartDO. SmartLink can link with the parameters in ANSYS Workbench directly with easy-to-use GUI. With the powerful solver in SmartDO, the user can cross-link any parameters in Workbench to any design parameters in SmartDO, such as design variables, objective function, and constraints, and SmartDO will usually solve the problem smoothly without much difficulty. We will use a simple 3D cantilever beam to demonstrate this convenient and efficient new interface. 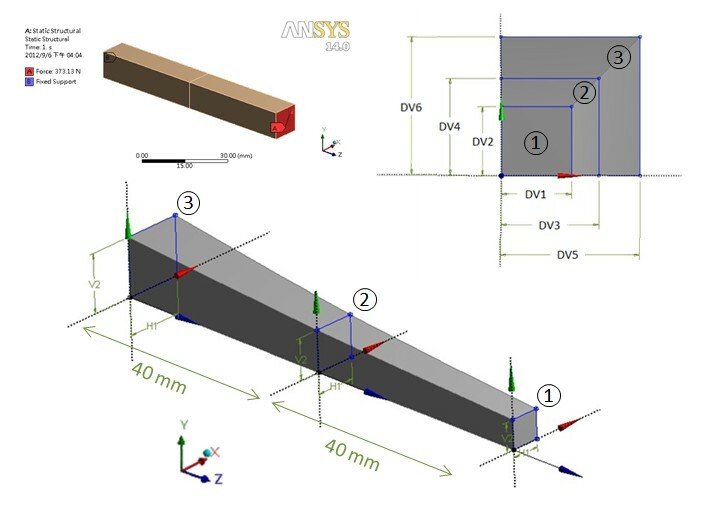 Consider a 3D cantilever beam with its design variables and boundary conditions shown at Figure 2. It is fixed at one end, and applied a force of FX=200N and FX=315N at the other end. 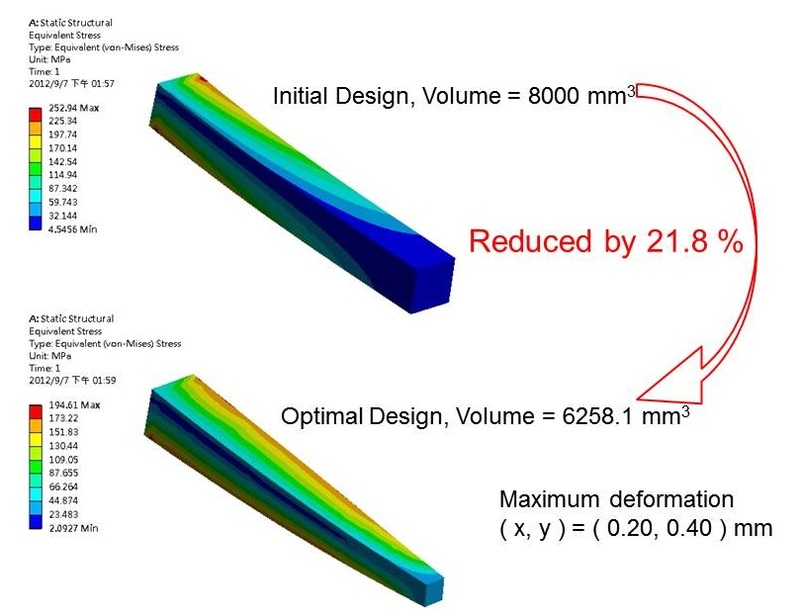 The design requirement is to minimize the volume of the beam, with limitation on the maximum deformation at the X, Y directions, and the maximum equivalent stress. As shown in Figure 3, on the left hand side is the parameters table in ANSYS Workbench. This table can be directly imported into SmartDO SmartLink with just one click of button, as shown in the right hand side of Figure 3. With the pull-down menu in SmartDO, the user can select any parameters in Workbench, and assigned into objective function, constraints or design variables in SmartDO. The user then specifies some necessary values from the formulation mentioned above (constraints, lower/upper bound and initial values of design variables, etc.). Then with few clicks of buttons, SmartDO will begin the optimization process. With the powerful and robust solver in SmartDO, the user can usually just use the default solver without any tweaking. With the combination of SmartDO and Workbench, the following result is obtained after design optimization. 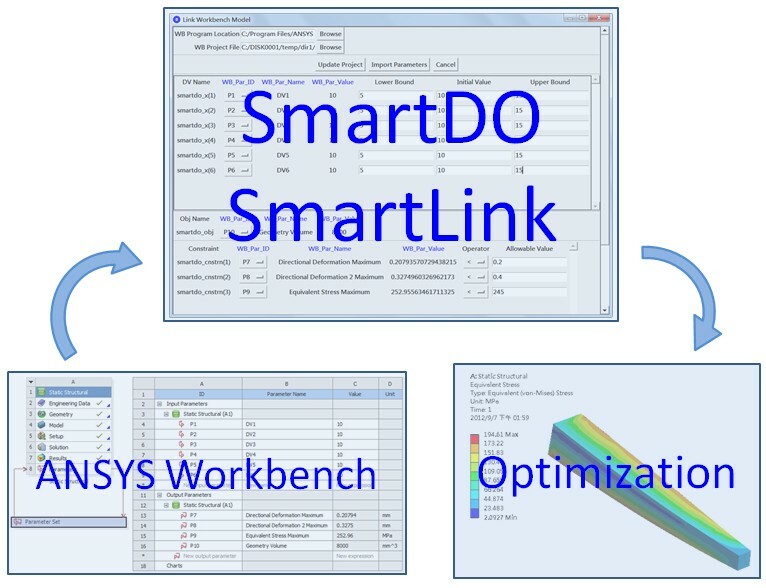 In this issue of the SmartDO eNews, we show you how the SmartLink interface in SmartDO can easily link with the parameters in ANSYS Workbench. With the powerful and stable solver in SmartDO, design optimization can be easily performed.